Garnier Fructis Pure Volume Dry Shampoo | Miss Monique D.
I recently bought the new Garnier Fructis Dry shampoo in a hope to find a cheaper replacement for the ever amazing Klorane dry shampoo. Over the past few years i have become a big fan of dry shampoos and i feel as though it's now become a hair care routine essential! I love the fact that i can clean my hair in between washes without having to go through a huge, time consuming routine. Dry shampoo = 3minutes max. The instructions say to 'hold the can 15cm away from hair and spray generously. Leave for 2 mins then brush product out'. Pretty standard instructions for a dry shampoo. Unfortunately if you have brown hair or darker i would pay extra special attention to how far you hold the can away from you hair. Spraying too close leaves an atrocious white cast which is very veerry hard to brush out completely. I found that even spraying 15-20cms away from my head left a slight white cast but was easily rectified with alot of brushing. The good thing is that once i brushed it out of my hair i found the smell didn't linger or if it didn't slightly i could easily fix it with a small spritz of perfume. 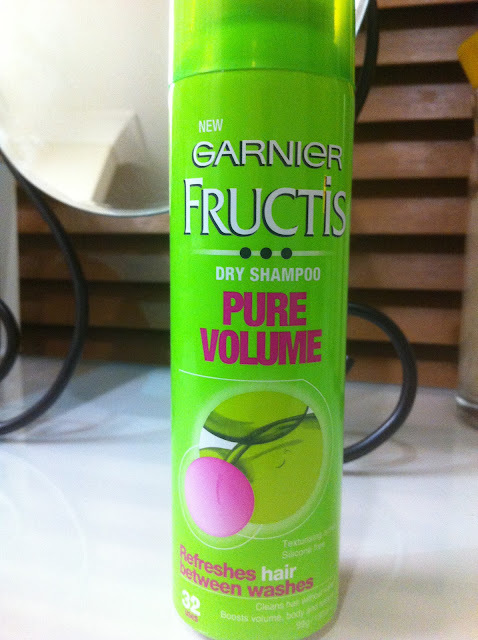 So the garnier fructis dry shampoo focuses on cleaning your hair between washes while adding texture and volume. I'm a sucker for products that promote themselves as 'Volume boosting' or 'Added volume' because my hair can get quite flat after about 5hours post blow dry. This product certainly added quite a bit of volume to my hair but unfortunately left it really fluffy, frizzy and hard to manage (My hair is pretty dry anyway and never really gets overly greasy so adding a powder always risks the chance to making my hair frizzy and hard to manage). I do give a big thumbs up for the volume factor because anything that can add volume to my hair get a thumbs up by me. I think for the price of $8 it is a reasonable dry shampoo and is worth a try if you ever have the chance (what doesn't work for my hair might work for yours). I probably won't repurchase this to use solely as a dry shampoo simply because it leaves a white cast on my brown hair and there are soooo many dry shampoos on the market that i do really really like or really really want to try. I might repurchase to use as a volume booster straight after blowdrying, at least that way i don't need to use too much therefore hopefully avoiding frizziness. oscar de la renta has a great dry shampoo! FInd at Ulta.